Over the years, our eyes age right along with the rest of our body, resulting in the clouding of the eye’s natural lens – Cataracts. By the age of 80, more than half of all Americans will develop a cataract, but don’t worry. Cataracts are very treatable. In fact, cataract surgery is the most frequently performed surgery in the country and has the highest success rate of any surgery practiced today. If your cataract begins to affect your quality of life, inhibiting you from performing normal daily tasks, such as driving, reading, or watching TV, cataract surgery may be your best treatment option. Cataract surgery involves removing the cloudy lens and replacing it with a crystal clear lens implant, called an intraocular lens (IOL). You all know the story. Goldilocks wanders into the home of Three Bears and begins to treat the place like her own. First she tries their porridge, but she’s picky. The first is too hot, the second is too cold, but the third is just right. Then she moves on to the chairs, with similar results, and then the beds. That Goldilocks sure was picky. But we are positive even she would love the LenSx® Laser. 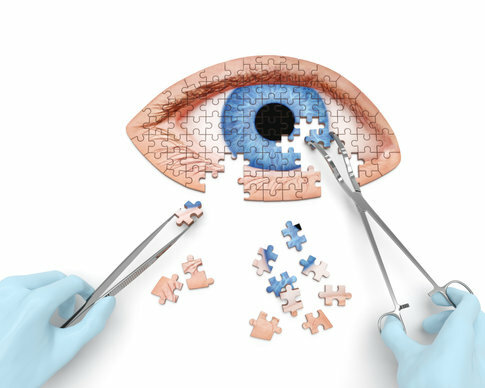 It’s the most technologically advanced option for cataract patients today, allowing your ophthalmologist to create a cataract surgery that’s 100% unique to you. It’s just right. First, the LenSx® Laser captures precise, hi-res images of your eye and plots a surgery that is unique to you. Next, a bladeless, computer-controlled femtosecond laser helps the surgeon perform your surgery with exacting, individualized precision not possible with traditional cataract surgery methods. A femtosecond laser is one that emits pulses with durations between a few femtoseconds and hundreds of femtoseconds. The LenSx® Laser is the most technologically advanced option today, allowing your ophthalmologist to create a cataract surgery that’s 100% unique to you. “The LenSx Laser offers significant improvement of precision, safety, and accuracy for even better results and I recommend this as an option for all of my patients,” said board certified ophthalmologist Dr. Samuel Boles, Medical Director of the Anne Arundel Eye Center in Annapolis, Maryland. The LenSx® Laser was the first femtosecond laser system to receive FDA approvals for use in cataract surgery. The Anne Arundel Eye Center (AAEC) is a regional leader in the diagnosis and treatment of cataracts. Dr. Boles utilizes the LenSx® Laser to create a cataract surgery that’s 100% unique to each patient. If you have any questions about Cataract Surgery Using the LenSx® Laser or wish to schedule an appointment with Anne Arundel Eye Center (AAEC), please contact Board Certified Ophthalmologist Dr. Samuel Boles, Dr. Kathryn Gurganus Turner, and the eye care specialists here at AAEC by calling 410-224-2010 or Click Here to fill out our contact form. You can also follow AAEC on Facebook, Twitter, Google+, and YouTube as well! Thanks for the information. I have cortical cataract and I need the lens implant. I am in Toronto, will you be able to recommend a compassanate doctor like you who is trained to do the LensX surgary here. Please kindly let me the cost of it too. The next part is choosing a suitable lens… I need to put togeather these 2 to work. I am a visual artrtist hope I find some guidance in choosing the right lens as well. Thanks.